One of the Tech Club’s three goals is to build the key skills that will make our members successful in the Tech sector. Since many of our members are interested in Product Management and Start-Ups, we decided to start our own Product Team. The goal? Go through the entire product development process from identifying pain points to testing hypotheses to prototyping to launching a product. Ambitious? Yes. Doable? We think so. Fun? Absolutely! With a small group of 7 MBAs from backgrounds as diverse as travel, finance, sales, history, and engineering, we have a diversity of talent, opinions, and skills. We meet weekly and started at the very beginning. Our first task was to frame our thinking by talking about apps or websites that we like and why. Among the apps we liked were Opentable and Box and we noted that we liked them because of ease of use and because they allow us to control things like when we pay a bill that we could not control before. Empowering users though an easy and beautiful user experience emerged as the key to impressing us and a guidepost for us to strive toward. Our next step was to identify and prioritize pain points in our lives that we could consider addressing. We came up with 18 different areas and the each chose the five we were most interested in addressing. Finally we chose all the pain points that received multiple votes and began hypothesizing ways to address them. 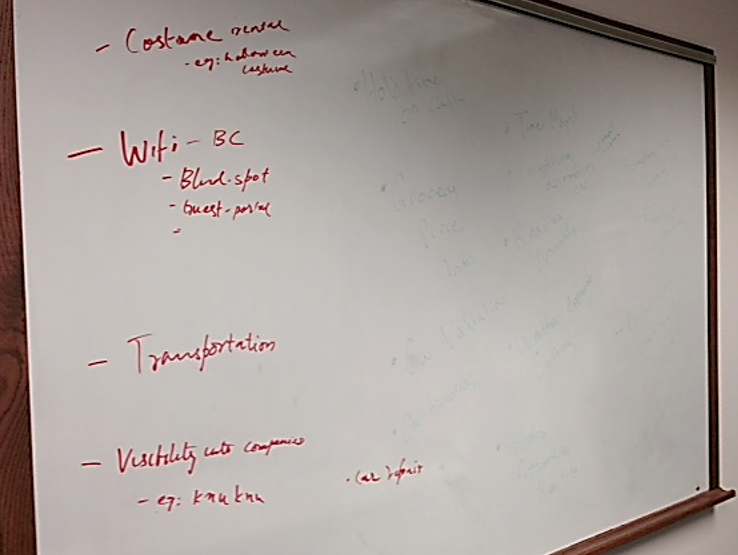 The ones we chose to address were Real Time Networking and Company Visibility, Forgetting Accessories, Grocery Price Info, Unsustainable Class Reading Amounts, MBA Shared Calendar, Car Valuations, Funding for Higher Ed, and Network Dead Zones. Our next step was to begin hypothesizing different ways we might be able to address these pain points and brainstorming how we could test them to see which are worth green-lighting to the prototype phase. To date we have only focused on the Forgetting Accessories pain point and came up with three approaches, each focused on a different dimension of the issues. Reminder app to make sure you don’t leave the house without what you need. You would specify what you are doing and depending on the response the app would serve up a list of what you should bring. Future iterations could learn your preferences and adapt recommendations. RFID chips clipped to important items that communicate with phone and let you know in real time if they are separated. A pick-up service that will retrieve your lost items from bars or restaurants the next day and deliver back to you. As a group, we were most excited about the RFID chips and team members were quick to start browsing for chips. The keeper of our (very limited) finances, however, I had to lay down the law saying I won’t spend any money until I have evidence that there is a strong desire for the product. Understanding this, we felt that surveys were the best way to test the market for RFID and the pick-up service. For the reminder app, we felt that survey’s may not be the best choice but are going to run a FB add to see if people would add emails to a waitlist. At present, we are still in the hypothesis testing face. We will address a few other pain points and then use the results of our tests to determine which ideas to pursue further. Check back in a couple of weeks to see where we stand!